Here at CELLINK, we want to inspire you to print more advanced models using the BIO X. In the following section, we demonstrate dual droplet printing with two of our bioinks. In this video, we demonstrate printing droplets side by side using a pneumatic printhead for CELLINK Bioink and a Temperature controlled printhead with nozzle insulator for GelMA A. Both CELLINK Bioink and GelMA A were diluted with 10% cell suspension and the cartidges were capped with 25G nozzles. Different bioink droplets were printed beside each other on a 12-well plate lid. CELLINK Bioink was printed at 15-20 kPa, while GelMA A required higher pressure of 35-40 kPa. Despite the different properties of CELLINK Bioink and GelMA A, both bioinks can be printed in the same printing session beside each other. 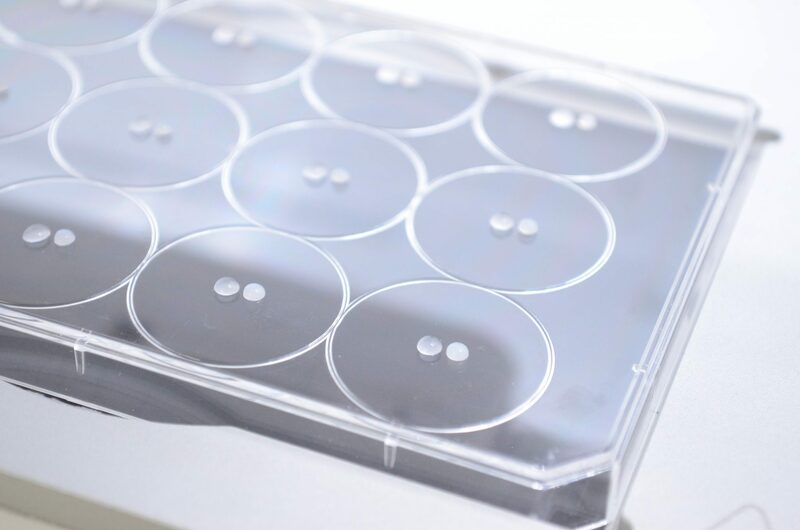 Both CELLINK Bioink and GelMA A droplets can be crosslinked by adding our crosslinking agent. Additionally, GelMA A droplets also have the ability to be photocrosslinked. The G-code for printing these dual droplets can be found on Bioverse. The distance between the droplets can be changed in the G-code from 4 mm to any distance preferred. Properties of GelMA-based bioinks and CELLINK Bioink differ in many aspects. 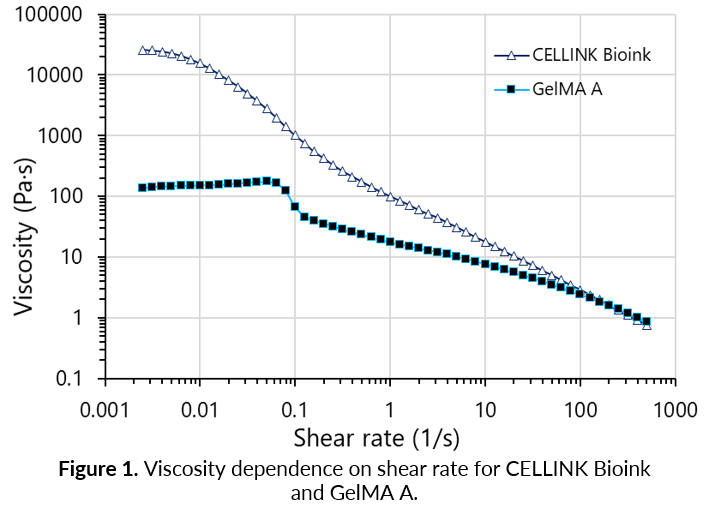 For example, GelMA-based bioinks exhibit shear thinning behaviour only at higher shear rates (above 0.1 s-1) and overall have lower viscosity than nanocellulose-based bioinks (Figure 1), which requires a different printing setup. To overcome this limitation, our BIO X system offers you the possibility to use up to three different printheads with individual temperature and pressure controls, and print with three bioinks simultaneously. GelMA-based bioinks have a distinctive gelation point, what makes them extremely dependent on the temperature of the environment. The gelation temperature point is defined as the intercept of the storage modulus and the loss modulus curves. For GelMA A, the gelation temperature point is approximately at 25°C (Figure 2A). At temperatures higher than the gelation point, the bioink has substantially lower viscosity and exhibits a liquid-like behaviour (Figure 2B). At temperatures below the gelation point, solid-like behaviour becomes more dominant which can cause clogging of the nozzle. Therefore, the recommended temperature to print GelMA-based bioinks is just above the gelation point at around 26°C. The multicellular models with different bioinks can be used for understanding cell-cell communication, cell migration mechanisms, and cell to matrix interaction controls. In cell-cell communication, one droplet can contain immature stem cells while the other droplet can have more mature primary cells to investigate paracrine signalling driving maturation mechanism with defined parameters. To study cell migration such as metastasis, cancer cells can be mixed in the bioink for one droplet and healthy cells can be in the second droplet to observe the behaviour of cancer metastasis. Cancer metastasis can further be investigated with the same cancerous cells but in biomaterials with different stiffness or extracellular proteins. These models can become complex by introducing supplemented factors that can influence these cellular activities.